← Does Your Diet Deliver? 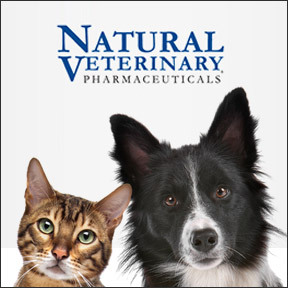 Professional Supplement Center now carries natural synergistic homeopathic remedies formulated exclusively for pets by Natural Veterinary Pharmaceuticals (NVP). Scientifically designed with comprehensive ingredients, these all natural therapies address complex veterinary health problems for dogs, cats, and birds to provide fast, gentle and safe relief without side effects. NVP formulations are manufactured in the U.S.A. with FDA compliance and in strict accordance with current Good Manufacturing Practices (cGMP). These time tested, guaranteed potency liquid formulations are designed to enhance the overall health and vibrancy of your pet, increasing their quality of life by empowering their own natural healing resources. Easily administered by adding to your pet’s water bowl, these pure, water-based medicines contain no alcohol, sugar or yeast and can be safely combined with other veterinary pharmaceuticals and procedures. These Natural Veterinary Pharmaceuticals are available exclusively through healthcare professionals. Digestion Reliever – This product provides homeopathic relief of symptoms such as gas, cramping, colic, pain or other abdominal discomforts. Skin Irritations and Itch Relief – This product is designed for fast relief of common skin irritations or generally unhealthy skin and is indicated for symptoms such as itching, scratching, hot spots, hives, eczema or psoriasis. Muscle Joint and Arthritis Reliever – This product provides fast, safe relief for joint pain and stiffness, muscle tension or cramps, weakness associated with acute or chronic spinal conditions and muscle or joint sprains and strains. Multi Stress Control – This advanced high-potency formula is designed for fast relief of a wide range of stress induced problems including anxiety, fear, nervousness and separation anxieties. It may also be used for gastric upset, poor eating, stress licking or other neurotic behaviors. Trauma and Wounds – This formula provides fast relief for a wide range of traumatic injuries including bites, sprains, fever, infection, and may be used post operatively to maximize healing and recovery. This entry was posted in Home and tagged Digestion Reliever, Multi Stress Control/Vet Multi Stress Control, Muscle Joint and Arthritis Reliever, Natural Veterinary Pharmaceuticals, Professional Supplement Center, Skin Irritations and Itch Relief, Trauma and Wounds, Vitamins and supplements, www.professionalsupplementcenter.com. Bookmark the permalink.